The perfect outdoor furniture for commercial use, DutchCrafters poly furniture is a highly durable form of outdoor furniture that can withstand any type of climate or environment. Outside of occasional washing, our poly furniture is virtually maintenance-free outdoor furniture, so you don’t have to worry about constant upkeep for this campground furniture! Most DutchCrafters poly furniture is even backed by a 5-year commercial warranty! With a wide variety of poly colors to choose from, our poly furniture is easy to incorporate into any outdoor décor and is sure to catch the eyes of all your guests. Use it around pools, buildings, playgrounds, on the beach, patio, or deck. Our highly durable furniture can be used anywhere outdoors! DutchCrafters poly is built using a recycled material called poly lumber that comes from recycled milk jugs. The poly lumber is then constructed into furniture by expert Amish craftsmen using building techniques that have been passed down for generations. The entirety of our poly furniture collection is made right here in America, and each piece even comes with free shipping! 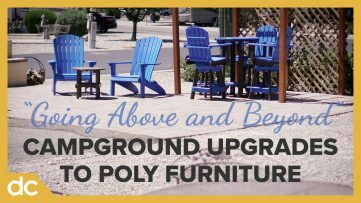 KOA Campgrounds used our poly furniture at their patio sites. They have found that once customers see these patio sites, many will request to upgrade to the sites with the colorful poly furniture. This prompted their decision to add another whole row of patio sites featuring DutchCrafters furniture. See just how KOA Campgrounds utilized our poly furniture and how happy they are that they made the purchase. There is really no comparison when it comes to poly furniture vs. outdoor wood furniture. Poly furniture will not rot, crack, splinter, or develop mold or mildew. Wood furniture on the other hand, will, at some point in its life, rot, crack, or splinter even after limited use. Poly furniture can be left outside in the sun no matter how hot or cold it is. The highly durable poly lumber used to construct poly furniture, along with its stainless steel hardware, means it can be used in any climate or region. Check out our Amish Poly Fan-Back Adirondack Chair for the perfect outdoor lounge chair that all your customers will love, or create a beautiful outdoor dining space for guests with the Amish Poly Patio Pub Table Set with Four Swivel Chairs. No matter what Amish outdoor furniture you decide on purchasing, you can be sure your customers will love it. Call and speak with one of our friendly sales specialists for our exclusive B2B pricing, possible customizations, or if you have any questions toll-free at 866-272-6773. Not convinced? See some of our other businesses to business furniture customers.